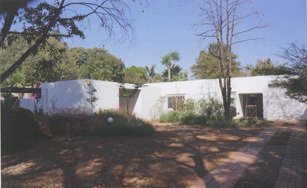 The site of House de Villiers is in one of the older eastern suburbs of Pretoria, near the university. This area of the city is mostly flat, while it has a relatively abundant tree cover with many mature specimens. The site proportions are narrow and deep, with the short dimension adjoining the street. On the street edge is an existing house, the original structure of the old Brooks farm. On the neighbouring site is a remarkable Victorian building. It was decided that the view of this building should not be obscured. The client's son, the architect of this project, lives in the original house close to the street. To maximise the available space of the property, the retirement house for his parents was placed as far back as possible. This 'backyard' space is now dominated by two older buildings - while the new building only serves to define the space. The design of this courtyard house is an impressive and meticulous exercise in careful planning. When viewed in drawings, photographs and in reality, one is left with the impression that no client wish or requirement has been neglected. This thoughtful attention to detail and ideas, big and small, has been achieved with minimal means and in subtle ways. It would seem that nothing is unnecessary or a frivolous indulgence. This carefulness is evident in both the way the space has been planned, and in how the services have been handled. The building has obviously been achieved with a frugality of means, but a generosity of spirit. All of this has been completed in an admirably sophisticated manner. The courtyard building typology is sadly neglected in South Africa. It is one of the most efficient ways to build and to use land. So it can only be hoped that House de Villiers will be able to rekindle interest in its wider application in the country. It is impossible not to mention the familial relationship between architect and client. From architectural history, we know that there are many famous examples (and a few infamous ones...) where this relationship has resulted in positive career-defining expressions of architecture. Keeping a longer-term view in mind, House de Villiers might just be such an example.